In a post for ThinkProgress last month, I discussed how a tightly-knit group of anti-Islam activists and organizations in the United States are in fact collaborating with and at times funding similar discriminatory and bigoted elements in Europe. In a recent apt example, notorious anti-Islam and far-right Dutch lawmaker Geert Wilders has announced he will be addressing members of Congress at two events later this month. Wilders, who has called for a ban on the Qur’an, the construction of new mosques, and Muslim headscarves, boasted on his blog of his invitation to the United States by members of Congress. His invitees are none other than far-right congressmen Steve King (R-IA), known for his vociferous anti-immigrant stances, and Louie Gohmert (R-TX), infamous for his House floor tirades about “terror babies” and claims that “radical Islamists” are pretending to be Hispanics to come to the United States. The trans-Atlantic alliance is in fact a match made in heaven, as Wilders’ conspiratorial and xenophobic views align well with the extreme right fringe of the Republican Party. After inquiries to Gohmert’s office for additional details about the April 29 reception, his staff merely told me that Gohmert had invited the Dutch politician to speak on Capitol Hill but that Gohmert is not hosting the reception. Wilders is also expected to speak at a breakfast the same day for lawmakers belonging to the Conservative Opportunity Society, a group that was founded by former Speaker of the House of Representatives Newt Gingrich. “I feel deeply honored by the invitations. 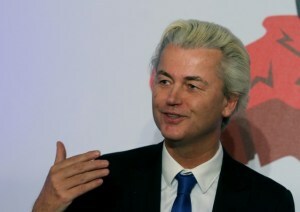 In my speeches I will warn my American colleagues of the dangers of Islamization,” wrote Wilders on his personal blog. This is of course not Wilders’ first speaking engagement in the United States. Wilders spoke at a 9/11 commemoration rally in New York City in 2010 where he voiced his opposition to Islam. During a visit to Denver, Colorado in 2012, Wilders warned an audience at the Western Conservative Summit of the threat of “Islamization,” called Islam a “dangerous, totalitarian ideology” and argued for banning the construction of new mosques in the United States. Horribly done. Either he’s cheap and buy his products from drug stores, or he needs to change his hair salon:). More likely his Indonesian black roots. I just found the below video…. Note I do not know what is being said but seems funny! Someone is trying to hide the grey…. Why did they invite chucky’s Dutch cousin to address them? This guy is as fake as his hair color.